Thanks to the Internet, America has become a playground for ruthless scam artists out to make an easy buck. And where do these models of entrepreneurship hail from? Why, the Sunshine State of course! No one loves Florida more, or can keep it safe from invasive criminal species better than self-appointed Sunshine Sheriff Serge Storms. When a particular scam leads to the death of a few innocents and a young woman’s disappearance, Serge and his perpetually self-bent sidekick Coleman – aided by his new pal, latter-day noir private eye Mahoney – load up the car for a riotous road trip to do right. 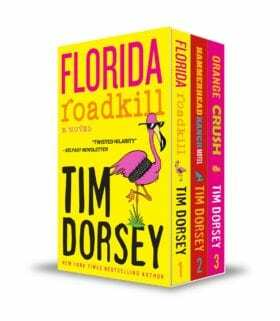 Packed with seafood, mayhem, blood, Coleman’s deep thoughts, Floridian lore, and more, Tiger Shrimp Tango is a hilarious adventure set in Tim Dorsey’s unique slice of America – where nobody gets out unscathed and untanned!